In this post we have make shopping cart by using Codeigniter Cart library. 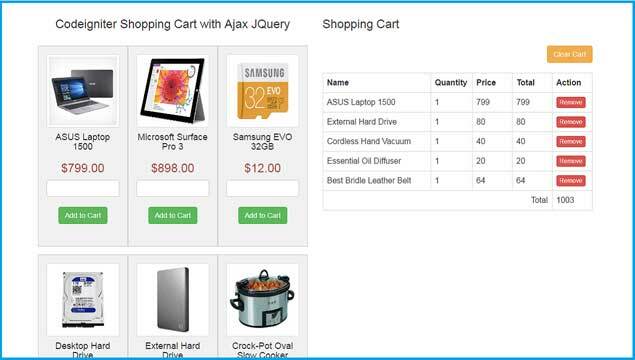 We have also use how to use Ajax JQuery with Codeigniter Cart class while making shopping cart. So we will shopping cart in which we can add item into cart without refreshing of web page. A Shopping cart is a simple web application that are use to make eCommerce web site on which you can create your online store and you can sale item online and order processing. Here we have use Codeigniter Cart class with Ajax JQuery to make simple shopping cart. Codeigniter Cart library has been initialize Session cart and it will store all cart data in session. So when user will refresh page or browse on another tag and again going to cart page then he can view his item on web page in cart. Codeigniter Cart Class provide core cart functionality it is not provide complete solution for online store but by using this class you can make shopping cart in which you can add item into cart, update item of the cart, you can remove item from cart, it also provide particular item sub total also, if you want to get the whole cart total also get by using this cart. If you want to clear whole cart item then by single click you can also remove all items from cart. You can perform all this operation without writing many lines of code but you can perform this all operation in single line of code. For initialize Codeigniter cart class in your application, you have to write this code. After initialize Codeigniter Cart library, suppose you want to add some item into cart then first you have to make array and in that array you have to define four keys like "id", "name", "qty", "price". This four keys are required field in cart library. Suppose you have miss any key then it will not add item into cart. After this suppose you want to add more field then in fifth keys you can write "options" with value and in value you can define extra field in array format with value. But you want to add only one fields then you have to simply write name in keys and value define in value. For Insert above item details into cart we have use insert() method of this library and it will insert item into cart. When we have you this method for insert item into cart then it will return rowid value. It identify unique id of particular item detail in cart. After insert item into cart now we want to fetch cart item and display on web page. So we have use this class contents() method which return array of cart item. When we have use this method then we can fetch cart item one by one. Suppose we want to get sub total of single item then this method will return single item sub total get from subtotal array variable. Here we have also define remove button also with class remove_inventory we will use as selector in jquery code and in id attribute we have store rowid variable value. From this variable we will get the unique id of particular item. For get the whole cart total, so we can use total() method of this class which return total of whole cart. After viewing cart item on web page now we want to remove single item from shopping cart. So we want to get unique rowid of particular item. After getting this value then after we have make one array with keys like rowid and quantity. In quantity key we have store zero as value. After this we have use update() and we have update particular item quantity to zero. In this cart library when quantity value will be zero then it will automatically remove that item. So this way we can remove single item from Codeigniter Shopping cart library. Suppose you want to remove all items from the cart, then it is very easy in Codeigniter class. You have to use only simple destroy() method of this library. This method will remove all items from this cart and it will display empty cart. So, this is complete details of how to use Codeigniter Cart Library to make simple shopping cart. In this post you can find video tutorial of this post and source code also. If you have any query regarding this post, please comment your query under comment box. ¿Esto lo hace en base de datos también o solo en 'cart'? quantity is not being passed for some reason how do i fix this?